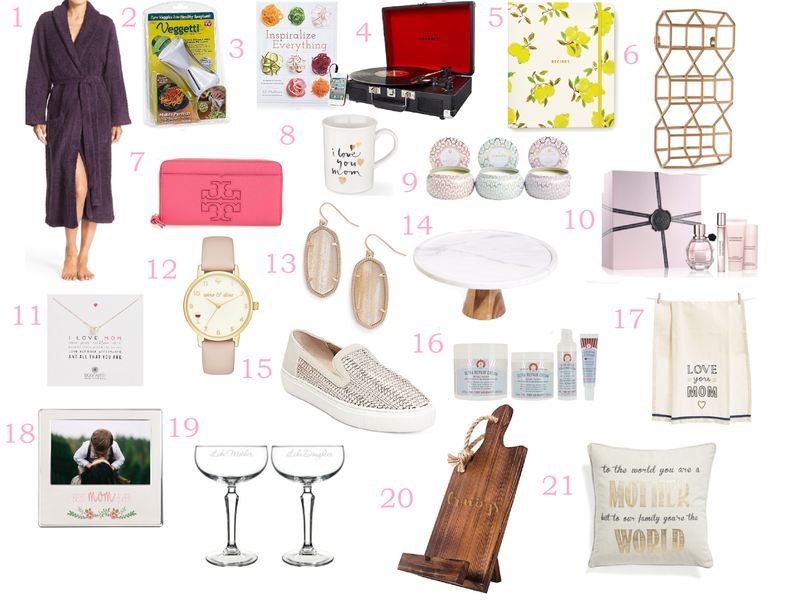 With Mother's Day right around the corner, I figured I would dedicate this weeks post to some gift ideas for that #1 lady in your life. I saw a funny quote somewhere that said 'Mother's day is hard when your mom deserves an island but all you can afford is a candle' which is so hilarious and true. What can you possibly give the woman who deserves it all? I've scoured the internet for the best gifts so you wouldn't have to! Just about every item I shared is under $100! 1.Barefoot Dreams - Robe. Give mom an excuse to kick her feet up, stay in her PJ's, and relax all day with this dreamy robe. Never underestimate the power of a good robe. I got a new one for Christmas and it was life changing! 2. Vegetti - Vegetable Spiralizer. If you/your family hasn't jumped on the veggie spiralizing bandwagon yet you really need to! Mom will love another gadget to add to her kitchen and the whole family will love all the new recipes you can make with the spiralizer. I got this for Christmas a few years ago and I am obsessed with Zoodles! So good and so healthy, too. Note: There are tons of more expensive and fancier looking veggie spiralizers that quite frankly look complicated to assemble and use. You really don't need anything more than this simple guy. It's easy to use, easy to clean, and no assembly. Don't fall for any other gadget. 3. Inspiralize Everything - Encyclopedia. Pair the Vegetable Spiralizer with this book to create the most perfect gift set! This is a really cool encyclopedia style book that tells you everything you can spiralize A to to Z - Apples to Zucchini. 4. Crosley Radio - Cruiser Turntable. The one I linked only comes in red but is ONLY $65!!! These Crosley turntables usually go for about $100. HERE is a link to more color options, but costing at about $100. Send Mom down memory lane with one of these bad boys so she can put her favorite Beatles vinyl's to good use. These turntables also have the capability to plug into your phone through an aux, which I had no idea and I will have to try this on mine - haha. 5. Kate Spade - Recipe Book. SALE - under $25!! Let's be real, there's nothing better than mom's cooking - this is a perfect gift to help her organize her your ☺favorite recipe's. And how cute is this lemon print? Not only cute, but functional too as it has several different tabs for organization and easy references to the best recipes. 6. Foreside - Geometric Wine Holder. This one is sold out but I linked a similar one. This wall mounted wine holder is so cute and perfect for any vino loving mom, which quite frankly is like all moms that I know. Is it bad that I totally want this for myself? 7. Tory Burch - Continental Zip Wallet. If you really want to spoil your mom, surprise her with this beautiful Tory Burch wallet. This is so pretty and functional - another one I want it for myself! 9. Maison Blanc Candle. When she deserves an island but all you can afford is a candle.. at least these candles are super cute! The scents include 'Laguna', 'Pink Citron', and 'Saijo Persimmon' - they sound heavenly and the pastel purple tins are adorable. 10. Viktor&Rolf - Flowerbomb Set. I know I've posted this perfume before but I am posting again because it is that good and your mom will love it. It is a little pricey but I think this set is a very reasonable price, and is also on sale! It comes with a perfume, body cream, shower gel, and a rollerball perfume. 11. Dogeared- I Love Mom Pearl Necklace. This simple yet stunning necklace fits any moms style and has a beautiful message as well. Comes in a gold or silver chain! 12. Kate Spade New York - 34mm Leather Strap watch. Such a pretty watch and another perfect gift for the vino loving mom's out there! I love this leather strap and gold face combo. 13. Kendra Scott - Elle Drop Earrings. Keep your mom cool and hip with these popular Kendra Scott earrings. I love these because although they are a larger statement earring, they are so lightweight! They come in so many different colors, styles, and stones that you can easily find one that best fits your moms style. 14. Thirtystone - Marble & Wood Cake Stand. I found a similar marble cake stand at TJ Maxx a few weeks ago that I was really iffy about purchasing and I am so glad that I did! I'm not making many (or any, for that matter) cakes that I'm displaying in my apartment or at social events but I use this cake stand more as a decorate piece in my kitchen. I put a few candles and a small vase of flowers on my cake stand and it really is the best decorative piece in my kitchen. This marble and wood detail is so pretty, too. Perfect and unique gift for Mom! 15. Steve Madden - Kenner Slip Ons. Steve Madden slip ons are not only so cute but really comfortable and practical too. I love the perforated exture design. 16. First Aid Beauty Ultra Repair - 4 piece set. I kept seeing a lot about First Aid Beauty on social media and I just had to try it. I got this 5 piece set back in Christmas as a gift to myself and I absolutely love all the products. Spoil your mama, and get her a spa treatment (minus the spa). She will love this! 17. Primitives by Kathy - Dish Towels.These are only $14! It's so funny that as I get older I am more into house decorative type gifts so I love a good new fun set of dish towels. TJ Maxx always has really cute ones for so cheap! 18. Cathy's Concepts - Best Mom Ever Frame. This beautiful frame with a picture inside of you and your mom is such an easy and special gift to get her. 19. Cathy's Concepts - Mother Daughter Champagne Glasses. This is hands down my absolute FAVORITE item on the list! How CUTE are these! Matching champagne glasses for you and your mom! I envision a perfect 'gram shot out of these glasses. 20. Cathy's Concepts - Ipad/Cookbook stand. I also love this ipad/cookbook stand. Such a great concept AND serves as a really cool decorative piece too! 21. Levtex - Accent Pillow. A cute accent pillow to add to any room with such a beautiful message! Great gifts for Mother's Day! Thanks for sharing. My mom would love so many things in the list. Great options! Beautiful products! I want to spoil my momma this year for sure! Awesome post and great ideas, thanks for sharing!